Is anything more important than communication when building and maintaining relationships? “Use your words…” This ubiquitous phrase is used by parents when trying to get their children to speak clearly and correctly, or to speak instead of grunting or whining. It may sound like a childish phrase but it’s no less important to adults. Speak clearly, speak coherently, speak courteously…perhaps most of all – speak instead of the alternatives (grunting, whining, yelling). How many adults do you know that use the alternatives regularly? 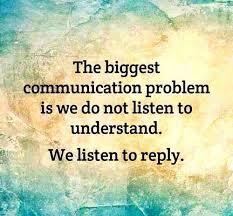 Let’s not forget that verbal communication is only a part of how we communicate with one another. You project your attitude towards others loud and clear by your physical movements. We all know that crossing our arms may say “I’m holding back,” “I’m angry,” or any number of negative attitudes. In contrast, turning towards people, smiling, putting our hands in a less defensive position (in lap or folded on table) tells others that we’re happy to be in their company. Non-verbal body language broadcasts our true intentions, no matter what our mouths are saying. This means that what you say may get undermined by your own body language. For example, if you say to someone “I’m not upset with you,” but you do so while you are visibly upset (perhaps you point emphatically, your voice is raised, you won’t let the other person speak). In a case like this, you can’t possibly expect the other person to believe that you are not upset with them. Let’s take a step back from this scenario and think about why you might say to someone “I’m not upset with you” in the first place. Many times, people say things like this specifically because they are upset but they’re afraid to let the other person know it. Nobody likes telling other people that they’re upset, but the alternative is frequently to say one thing while your body language communicates something very different. Therefore, you are always better off being open about your state of mind, so that your words and your body language will match. This is not to say, naturally, that I’m suggesting you be cruel just for the sake of clear communication. Let’s take this statement: “I want you to know that I’m disappointed because you ___ when you and I discussed _____.” These exact words can be delivered two very different ways. The first way might be with a raised voice, standing when the other person is sitting, and pointing your finger. The second way might be said quietly and slowly, with your hands folded on a table top as you neither lean in or back too much. It isn’t hard to see how you’d prefer to be spoken to. Others can easily see when there is a disconnect between your words and your body language. What isn’t as easy is seeing it in yourself – particularly in tense situations. There is no magic bullet to solving this problem other than taking the time to be careful about what you say, how you say it, and even when you say it. If what you need to express is uncomfortable, you are much better off taking time (a moment, a few minutes, an hour) before saying it. This may mean temporarily stopping or delaying the conversation until you have time to choose your words carefully and even thinking about how you will comport yourself physically during the conversation. This is far better than either avoiding the conversation entirely or lying just because you think it may avoid hurt feelings. Just how important is communication to relationships? Does anything occur between people that isn’t related in some way to communication? Is anything more important than communication when building and maintaining relationships? Do you have stories of how others have said one thing to you while their body language said something very different? Let us know by leaving us a voicemail at 1-646-653-9278 or sending us a message here.